Maximize your space by shedding the junk that tends to accumulate. Summer is closer than you think, and with all that winter stuff still cluttering up your garage, it’s time to think about bringing order to your space. 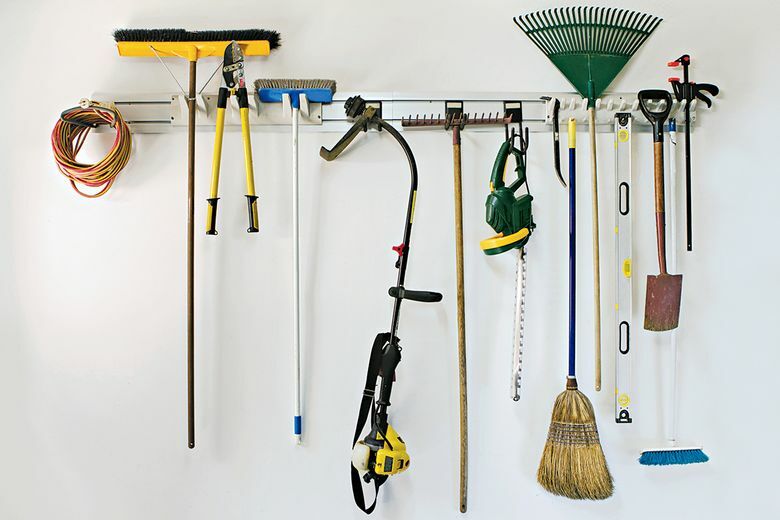 These tips will help you keep your garage organized for good. The right mindset is the most important tool you’ll use in organizing your garage. Before you create a new storage system, go through your belongings and decide what you want and need to keep. Are you storing old paint you’ll never use again? Electronics that you thought you’d eventually repair? Be honest with yourself, and ruthlessly pare down what you don’t need. Decluttering is a liberating process. And you’ll be surprised by the amount of space it will free. The biggest stuff should receive the most consideration. Freezer, secondary refrigerator, lawn tractor — these items take up the most space and are hardest to move. Determine where the big stuff goes and work around it from there. Hang trimmers, extension cords, long-handled tools and even bikes on simple hooks to free floor space and assign each item a dedicated place. Mount a peg board on the wall to neatly store tools. (It helps to draw an outline of each tool so you can easily see where it belongs when it’s time to put it back.) Take care to mount these hooks on wall studs to ensure they’re secure. Use overhead storage to make the most of otherwise wasted space. Many garages have built-in attics or high-pitched roofs that lend themselves perfectly to skyward storage. If you don’t have a second level for storage in your garage, consider installing a ceiling-mounted storage unit, hanging shelves or building an entire overhead loft, complete with ladder access. Many off-the-shelf storage solutions can stash your entire family’s bicycle collection, camping gear or holiday decorations all above your parking space. Deep shelves are a must _ whether they’re in custom-built cabinets or a simple stand-alone rack. Ideally, garage shelves should be at least 24 inches deep and strong enough to hold the weight of your stored belongings and more. Keep the items you use infrequently in the back and the tools and equipment you use most frequently in the front for easy access. Store hazardous items like engine oil, paints and household cleaners safely and out of reach of little hands. And when you decide to get rid of them, be sure to dispose of them properly. Follow the instructions on chemical containers for safe disposal, and check with your local municipality regarding rules for potentially toxic waste.